If you are a serious student of alchemy, then you owe it to yourself to read all the works listed here. The secret of the Philosopher's Stone is that it's not a secret at all. If you read this library of information on these links below, and you still can not produce the stone, then you should walk away from alchemy because it is not for you. This is a collection of rare alchemy manuscripts transcribed by alchemists all over the globe under the organization of Hans Nintzel. Contained in this vast assortment of literature are processes that explain very clearly how to produce true alchemy treasures by a number of different paths. Everything from using Vitriol and acids, to using antimony, or just using the fluids of the human body. From the simplest methods to the most advanced. 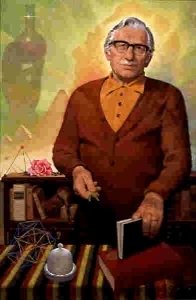 This man was one of the best alchemy teachers to have lived in the 20th century. Founder of the Paracelsus Research Society which later evolved into the Paracelsus College. At their website, be sure to also read all of issues of Parachemy and Essentia because you will learn a great deal. Traid Publishing created the PON (Philosopher's of Nature) newsletters and alchemy courses. I highly recommend buying all of the back issues and alchemy courses. Some of the issues are also available for free on their website so you can get an idea of the kind of alchemy knowledge they had.